Chestnut is an 8 bedroom Premier Villa in the countryside outside of Florence, Tuscany. This important property can count famous historical figures among its owners. The History was recorded as early as 970 as belonging to the Bishop of Volterra. It was badly damaged and sacked by Piccinino's troops in 1430 and by the Sienese army which spent the night there on 13 June 1554. There was already a 'Mansione' or hotel in the farm known as the 'Osteria Vecchia', which was moved to a larger and more spacious premises in its present site beside the provincial road. It became part oof the farm which was built there in around 1600 by the Senatoria dei Rinuccini family from Florence, both as their own home and to administer the other properties they had acquired in the area. In around 1815 it was inherited by the Marchesi Capponi of Florence. The Grand Duke of Tuscany visited the house on several occasions, together with his retinue, and almost always stopped to dine in the Villa with the Capponi. In 1834 it passed to Marchese Attilio Incontri as part of the dowry brought by his wife, Donna Ortensia, the daughter of Marchese Gino Capponi. The Estate - is on Monte Cornocchia. 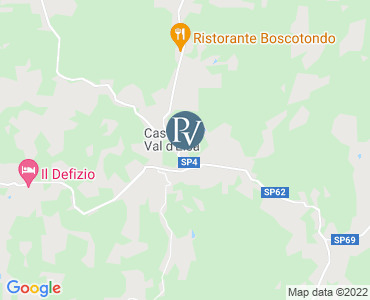 It lies beside the provincial road to Volterra, known as the 'Volterrana', near the crossroads where one road leads to Volterra, another to San Vivaldo and the third to Castelfiorentino. This is also the meeting point of three valleys: the Elsa, the Evola and the Era. This spot also marks the boundary between three old 'contadi' in the municipalities of Pisa, Florence and Volterra: in 1308, three delegates from the three Republics established the territorial boundaries between the districts of Volterra and san Gimignano. The Accomodation - The property is composed of the Mansion house and 14 independent apartments with their own private space to eat outside.The Villa is 368 square meters on the ground floor and 375 square meters on the first floor. It is in a large park where a lake, a swimming pool (20x10m) can be found. There is also a golf course close by (Castelfalfi Golf Club). Guests also have access to a typical Tuscan Trattoria and a bar/pizzeria where groceries and local gastronomic products can be purchased (wine, extra virgin olive oil, honey, grappa). It consists of 4 ensuite double bedrooms, 4 ensuite twin bedrooms, kitchen (equipped with cooker, oven, fridge, freezer, dishwasher), and living rooms. LOCAL TAX - all tourists are required to pay €1 per person per night (except children under 14), for the first 6days. The payment is compulsory and must be in cash directly to the owner on arrival. Swimming pool open: beginning of May - end September (depending on weather conditions). Guests also have access to a typical Tuscan Trattoria and a bar/pizzeria where groceries and local gastronomic products can be purchased (wine, extra virgin olive oil, honey, grappa). WEDDINGS/EVENTS - Apartments Sycamore, Spruce & Maple must be booked together with this villa. All prices are per week for the villa only. Check-in at the Villa is from 4:00pm to 6:00pm on your arrival day (Saturday) and check-out 9:00am on your departure day (the following Saturday). Please note that availability shown is subject to confirmation - please call our reservations team. So many lookers in such a good-looking city! Naked like Michelangelo's David or rugged up in the latest winter fashion by their own world-class designers, Florentines and their city never fail to impress. Already in need of oxygen after admiring their art, visitors are mesmerised by the vision of locals at aperitivo time, effortlessly strutting, flirting and evidently enjoying life. At times it seems nothing much has changed since the days of the Medici. Of course much has changed. Florence's short-lived stint as capital of Italy in 1865 was like a shot of adrenaline. The city bulldozed, constructed, rearranged avenues, wiped out whole quarters and tore down the medieval walls. And so the scene was set for the modern regional capital of Tuscany. Along the broad viali (avenues) that encircle old Florence a confusion of endless traffic tears around in chaotic style. Horns honk and brakes squeal as Florentines dart in and out of lanes in search of a break in the traffic. Ignorant of fear, 'motorini' (moped) riders dash in and around larger vehicles, as if protected by some divine force. The jewel of Renaissance Italy remains essentially what it was - a busy business centre. Even before the Renaissance was over, the wily Florentines had to concede that their town was on the wane, increasingly ignored on the European stage. But they never forgot their proud heritage and it was rediscovered in earnest by the rest of Europe from the late 18th century. Curious and admiring travellers, particularly the English, descended on the city as part of their Grand Tour. Ever canny with currency (after all, Florentines invented the florin, one of the most successful currencies in history), the locals knew how to cash in, as they still do, with utter aplomb. The fortunate few get their first glimpse of Florence from the south. The road from rival Siena leads you to the heights backing the south bank of the Arno. Suddenly, through the trees, the glories of Florence burst into view - Giotto's Campanile (bell tower), Brunelleschi's dome, the Basilica di Santa Croce. Only the hardest of hearts can remain unaffected. The memory of the Medici, who for centuries commanded the city's fortunes and were, as generous patrons, instrumental in unleashing the Renaissance, lives on. To this day the family crest of six balls adorns many public buildings. The city's artists and sculptors, supported by the Medici and other powerful families, regaled the city with their finest creations. Michelangelo, Leonardo, Donatello, Giotto, the Lippis, Masaccio, Botticelli, Pontormo and a host of others left their mark, and formidable galleries such as the Uffizi, Pitti and Accademia today house many of their works. Medieval and Renaissance Florence was a financial powerhouse but it was never a romantic place. Its great families built fine mansions and lavished money on churches, public buildings and the arts, but not out of a love of beauty. To display greatness was to be great. The majesty of the Romanesque Baptistery, the Gothic Duomo and Renaissance basilicas was an advertisement as much of the power and wealth of Florence's leading families as of the city's artistic prowess. The families have gone, but the advertisements live on! Florentines are born into a world of extraordinary timeless beauty, so it is hardly surprising that they cultivate their appearance, and do it so effortlessly. Home to the likes of Gucci and Ferragamo, Florence means one thing: style, both past and present. Phalanxes of stylish boutiques line up alongside the galleries and palazzi. When the shops close, it's time to eat. Sit down to a simple Tuscan meal of tomato stew followed by prime steak in a family-run trattoria or splash out on one of the city's classic gourmet restaurants or stylish designer eateries. Florence is known for its top-grade Chiantis, but you should make the acquaintance of other exquisite tipples too: Montalcino's Brunello, the Vino Nobile di Montepulciano and the more daring Super Tuscans. You can easily explore Tuscany using Florence as a base: enjoy the medieval splendours of Siena, Pisa, Lucca and San Gimignano, and wander the undulating Chianti countryside. Tuscany lives up to anyone's expectations thanks to its beauty, famous wines and the rich artistic patrimony. Its landscape, with its gentle rolling hills, has found a special place in the heart of many, from holidaying PMs and retired executives from all over the world. Most only venture as far as Florence missing out on the breathtaking Siena, Pisa and Lucca which are just within a short drive away for a day trip. Cruising around the countryside you stumble upon medieval fortified hamlets perched on top of hills that maintain their charm intact and nestle great ‘Osterie’ (small restaurants) for mouth-watering meals and wines.